Only specialists are authorized to issue the Demand Certificate. These can be engineers, architects or tradesmen with special certification. The cost for the Demand Certificate is dependent on the size and the intended use of the property and will be between €300 and €750. The consumer-oriented ID is substantially cheaper, starting at €50 due to a smaller workload for the issuer/assessor. 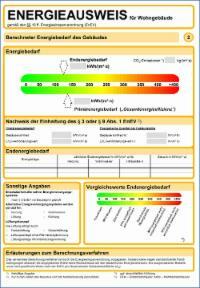 The certificates contain concrete modernization recommendations, which can be used to plan the refurbishment of a building or to develop more detailed energy advice.